I recently attend the excellent Australian Human Rights Arts & Film Festial (HRAFF) in Melbourne where a collection of short films were presented at the Australian Centre for the Moving Image (ACMI). The HRAFF has been running for nine few years, and seeks to “hold a mirror to the uneasy truths of our times and reflect our stories” through creative means – and that it does. The International Shorts screening that I attended comprised a collection of five award winning films from around the globe that presented a broad range of international and social issues in bold, despairing, humorous and challenging ways. All of the five films (perhaps with exclusion of Ave Maria) where tied together by common themes of: power, privilege and capacity. The film-suite seemed to emphasise how privileged we are in Australia, while also inspiring and subtly challenging the audience to consider how we can more fully use our vast capacity to facilitate change and empowerment of vulnerable people both locally and internationally. Using clever camerawork to provide a feeling of disorientation as well as buoyancy at sea, this Shipwreck is light on dialogue and heavy on impact. 26 year old Morgan Knibbe‘s moving film is shot through the perspective of one of the 155 survivors of the well publicised ship-wreck that was carrying 500 Eritrean refugees that sank off the cost of the Italian island Lampedusa, 3 October 2013. The viewer is presented a world of disperse, chaos and loss as the remaining survivors and the local police are forced to deal with the aftermath of the tragic voyage. Listen is a painfully realistic lesson in understanding the difficulties of migrants who cannot communicate in the primary language of their new resident nation. Somewhat reminiscent of Alejandro González Iñárritu and Guillermo Arriaga‘s tragic film Bable, Listen tells the story of a Musilm woman seeking Police protection from her abusive husband against the wishes of her intentionally misleading Muslim translator and her teenage son. Change for this woman is shown as nearly impossible against such cultural inertia and language barriers. Nora el Hourch‘s film tells the story of a small rough-edged band of young women in France that are coming of age amidst passively and actively abusive men. With plenty of humour, and plenty of shock A few seconds shows the importance of community and friendship when coping with life away from the support of family. Patrick Vollrath’s ‘short’ film tells the story of a desperate father seeking to kidnap his child out of his loneliness, despair and anger at his current custody arrangement. Tastefully shot, Everything will be OK, allows the audience to simultaneously sympathise with the father while understanding the suffering of a poor child caught in the middle of parents’ fighting and broken relationships. In the final moving scenes the daughter seems to behave more like an adult than her Dad while literally being pried from his arms. A start contrast to the other four shorts – it is clear that the program directors had learned from last year, the importance of allowing the audience to leave the cinema smiling as well as being shockingly moved. Ave Maria is a quirky tale of a handful of Nuns and Jews that are forced to help each other in the West Bank under the most unlikely of circumstances. Making light of some Jewish and Catholic cultural traditions and stereotypes, Ave Maria seems to ironically elucidate the similarities between different religious and cultural groups by forcing the audience to somewhat laugh at the small and large things that makes some communities appear different. Vietnamese Proverb: Minh. Gọi nắng xuân về. Nhàsách Quang Minh. p. 116. Over the recent end-of-year holidays I was very fortunate to visit both Malaysia and Vietnam for three weeks. My one week trip to Malaysia was a holiday in the true sense – visiting the land where my father was born. His parents, or my grand-parents, were working in Penang, Malaya as it was previously called when a British Colony between 1949 to the mid-nineteen-sixties. Penang is a very multi-cultural city with plenty of hustle and bustle. One of the most encouraging aspects about this city was how the different cultures and religions were able to live peacefully amongst each other. On the main street was a: large protestant church, Muslim mosque, Buddhist temple, and Hindu stores selling incense and idols. Trips through Ipoh and Kuala Lumpur revealed a more Muslim nation with great food and welcoming people. However, my trip to Vietnam was of a somewhat different nature. Choosing to study and work as an engineering was a decision I made some years ago to hopefully help those less fortunate in practical ways. After a brief presentation from one of members from the Kew Baptist Vietnamese congregation’s outreach group With A Mission (WAM) at an evening service I was encouraged to join the team for the one week mission and exposure trip. As part of the trip we were to assist with the construction of some houses for local poor people, who, although owning land were often unable to construct or afford a decent house due to being widowed or elderly. We were also to assist with a medical program that the church regularly runs. Fundraising for this church and its activities was conducted prior to leaving. Firstly, I was shocked with how these very poor Vietnamese people lived and interacted with the rivers and water. Each day we took a boat for over an hour (each way) along the Mei Kong delta. In this tiny boat I saw how the river was used for washing people and food, and for drinking, however, it was also used as a rubbish dump for plastics and human effluent. Regularly our boat’s motor propeller had to be taken from the water to remove tangled plastic bags that were stopping it from working – however, the driver would simply then throw these removed pieces of plastic back into the river before continuing forward. Internationally, sanitation and poor access to clean water are among some of the largest reasons for infant death, and place a great drain on the communities where people may regularly become ill.
Secondly, I was amazed by the vibrancy and work of the local church. Prior to leaving we had been fundraising for the work of a partner church in the region. While we were there: over four houses were being constructed; their main church building was finishing its construction; their church manse was knocked down prior to building a new one; another smaller-church building was about to begin construction for a new congregation; and a medical program was run where many Christian doctors from Saigon visit the region seeing over 500 patients. These Christians are a minority amongst their Communists and the Buddhists neighbours – however, they are well respected for their generous work by the local people. Due to their poverty and most not having any formal ‘weekend’, except for schooling, it seemed that in these poorer regions that only the Christians had a day of the week that differed from any other of the week – trying to make ends meet. Thirdly, I was humbled by the stories told by our Vietnamese team members. I distinctly remember one morning at breakfast where Pastor Khoi was speaking about his escape from Communist Vietnam as a 14 y.o. boy on a refugee boat with his aunt. He then proceeded to go around the table of primarily Australian-Born-Vietnamese (ABV) team members and tell how each of their respective parents had each risked similar trips. The only two people at the table who did not share this same history was a local Vietnamese Christian worker and I. Over 1 million Vietnamese asylum seekers died at sea between 1975 and 1995. This trip was a wake-up-call and a reminder of both the realities of poverty in our world and the opportunities for Christians, among all people, to love those less fortunate. Dragon Bridge, Da NangAfter the mission trip I was able to holiday with some of my new friends through: Saigon – a busy, dirty and changing city; to Nha Trang – where I discovered many Russian tourists and proportionally very few other international visitors; Hoi An – a city with a beautiful UNESCO world heritage protected zone that was heavily influenced by the Chinese; and finally, to Da Nang – arguably Vietnam’s most modern city, featuring many large bridges, including the now famous Dragon Bridge that breaths fire during public displays. This post is the first of a series of posts about my travel experiences between March 2015 – March 2016 to New Zealand, Malaysia and Vietnam. Sometimes the road less traveled, is less traveled for a reason. TV giant Seinfeld turns twenty-five this year—which is exactly the sort of round number that justifies Farrago publishing a nostalgic puff piece in recognition of the show. While growing up, I watched the ends of an uncountable number of Seinfeld episodes while waiting for The Simpsons to begin at 7:30pm on Channel 10. As dictated by the norms of our generation, however, you can’t really say you’ve seen a TV show until you’ve mastered it in complete box-set form, ensuring you haven’t missed one episode, punch line or running gag. I’ve been working my way through the collection for the past eighteen months, and still find myself just over half-way through the series. Rounding out at 180 episodes, the magnum opus of comedians Larry David and Jerry Seinfeld is equal parts brilliant and equal parts banality. The more I watch the show, the more impressed I am with how easily the talented screenwriters turn everyday life experiences into memorable twenty-something-minute mini-masterpieces, of worldly observations and kooky character studies. The representations are so strong that George, Elaine, Kramer and Jerry almost don’t need a plot line for the jokes to come hard and fast—hence Seinfeld being dubbed the “show about nothing”. These thirty-something New Yorkers are somewhat drifting though their existential life with no overarching purpose while pulling gags over first world problems. From a post-‘something’ generation, the characters are depicted with some life-goals—such as George’s search for relational satisfaction or Elaine’s career progression—but ultimately the events of their lives seem pretty trivial. And the more their aspirations for satisfaction fail, the more we find the characters human and endearing. The Seinfeld four are shown to be happy with being somewhat unhappy about life. Much like the 2006 film Little Miss Sunshine we are told that real happiness in life comes from enjoying the little moments of joy for what they are. Consider The Parking Garage episode, where the awesome foursome meander through a ubiquitous car park, unable to locate each other, nor their car. Almost like an allegory for the entire show, or wandering around in the dessert for forty years, they cleverly weave a cutesy little story and punchy one liners into the dialogue. 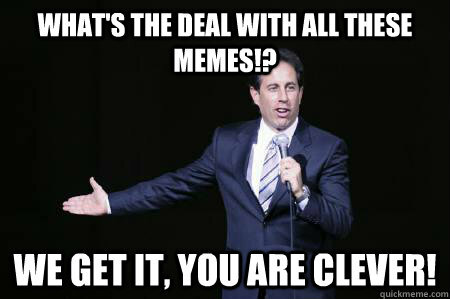 Seinfeld is often a tragedy of miscommunication or lack of modern technology. Much like Shakespeare’s Romeo and Juliet—where all would have been well for the star-crossed lovers if only Friar Laurence and his donkey had delivered that all-important letter in time—the conflict in about half of the episodes could have been avoided if the characters just owned a cell-phone. But as the exercise of working through the box set seems to last forever, I am disappointed at how the characters often work so very hard to try to make ‘nothing’ into ‘something’ entertaining. Not only are much of the mobile-phone-less common experiences outdated, but also the pop-culture references and not-so-understated product placements. Although we love the characters for their antics and pet-hates, they are essentially quite selfish and hollow—only caring for their tiny circle of friends at best of times. And after 100 or so episodes I find Jerry Seinfeld’s stand-up interludes causing me to yell at the screen, “What’s the deal with all the “What’s the deal with?” observations?”. Watching Seinfeld in 2014 makes me both laugh and cringe at how blatantly un-PC this sitcom could be, with its mildly homophobic, xenophobic and sexist undertones present throughout all nine seasons of this primarily male-dominated show. Of course looking back the funniest thing about the show now is the characters’ fashion sense: from Elaine’s early 90s shoulder pads, velvet dresses and perms, to George’s wide checks, to Kramer’s freewheeling shirts. Though nothing quite beats Jerry’s denim jeans and runners combination, or junners for short, a fashion faux pas that even the most mod hipsters of Brunswick are too afraid to claim back ironically. The biggest joke is on us, however, as Jerry Seinfeld and Larry David end up getting away with making an insightful and reliable show about nothing, with vacuous but loveable characters having a laugh at both themselves and life. 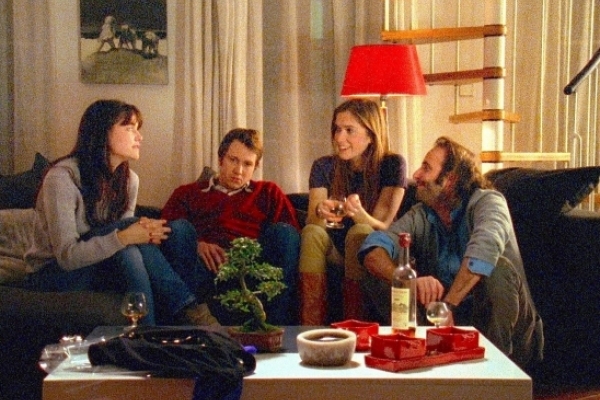 If you were not previously afraid of turning 30 then perhaps French director and screen writer Sebastein Betbeder’s recently released second film will have you fighting to ensure that your youth is not wasted while you are still young. 2 Autumns, 3 Winters follows three thirty-something year olds falling in and out of love. Trying to embrace this new phase of life, each character is both shocked and regretful at how their youth has passed them by. Thirty-three year old protagonist Arman (Vincent Macgaine) decides to make a change to his uninspired life by starting to regularly run in a local park. Looking like Bill Bailey on bad hair day, Arman meets the beautiful Amelie exercising and falls for her immediately. Over the course of two autumns and three winters we witness a series of dates; double dates; stokes; serendipitous meetings with former lovers and former colleges; and mundane trips to the supermarket as the film paints a picture of life past the big three-zero. Each scene is literally numbered, like a chapters in a book, as the detailed exposition of a series of eclectic, somewhat intertwined moments, show that life is unexpected in both joy and sadness. In an underwhelming Woody Allen stylised way, the characters frequently self-narrate their conversations by speaking directly to the camera and describing their feelings—often as polar opposites to the other party in the conversation. In a repeated motif, each of the male characters meets their love-interests during unfortunate incidents. It is a bitter-sweet irony that only through suffering does something good seem to come these hapless hommes – all in spite of Arman and Benjamin (Bastien Bouillon) trying to control their own destinies. Despite intermittently offering brief moments of humour and glimpses of hope, it is unfortunate that Betheder’s directorial creativity is at the expense of strong storytelling. Experimenting with the medium, the film alternates between grainy 16mm footage and High Definition (HD) producing a semi-autobiographical tone. However, one cannot help but feel that too much effort has been placed in making the film seem cutesy and indie rather than allowing viewers to emotionally engage with the characters on a deeper level. “I had trouble appreciating the vast landscape before me” exhaustedly says Amelie—perhaps best encapsulates 2 Autumns, 3 Winters’ contention about growing-up and life post 29. Colin neatly tucks his longboard under his arm before getting into the lift and heading up to his office job as a Quantity Surveyor in the city. Everyday he rides four and a half kilometers on his homemade longboard to the train station, followed by a short skate from the station to his office door. Building his first board four years ago, he has since designed a number of different custom decks. Colin loves to take his three-year-old girl for a short ride, “Initially she was a bit afraid, but now she really loves it. When she gets a bit older, I’ll probably make her a board of her own to start learning on while she’s young”. Like the many others that are now rolling the streets, Colin is a part of the growing community of 20 to 40-year-old males who are picking up skateboards, despite not skating in their youth because they didn’t fit into the skate scene. Skateboards started appearing in California in the 1940s and 1950s, and were used by surfers wanting to practice when the swell wasn’t up. Reaching its peak in popularity during the late 1990s, skateboarding was dominated by massive commercial brands such as Globe, Vans, and World Industries. Competitive trick boarders like Tony Hawk became household names, and computer games such as Tony Hawk Pro Skater and 1080⁰ Snowboarding were a huge success. On the back of this popularity a skate culture developed, where to be considered a skater meant wearing the popular skate gear and being able to perform tricks. Then, in the mid 2000s skateboarding dropped out of vogue; almost as a counter response to the hyper commercialisation, marketing, branding and the pressure for skaters to perform tricks on demand. High social and financial entry barriers discouraged the non-committed from getting involved. 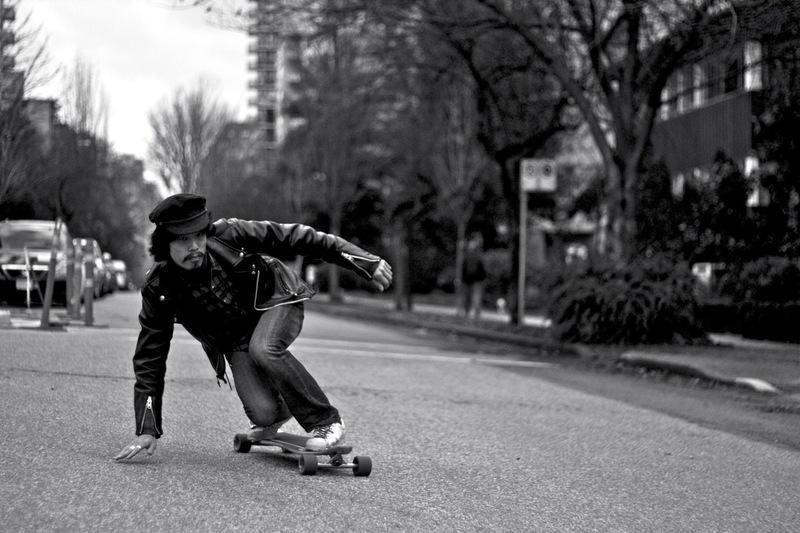 However, skateboarding is currently regaining popularity in a four-wheeled youthful renaissance. Boarding is back, and everybody is doing it: from businessmen, to construction workers, to your average, and not so average, Joe. People have rediscovered the joy of just cruising around on four wheels. In a response to the commercialisation of skating in the 1990s, people have begun to embrace the diverse family of skateboards, many of which are hand crafted, personalised, and unbranded. There are a plethora of shapes, colours, lengths and widths available – all a far cry from the standard black trick-deck of the 1990s. Although there are still branded boards such as the Penny Board or the RipStik, along with other popular skate clothing brands, many of the new skaters are learning the joy of riding around without any of these logos, slogans or dollar markups. One particular type of deck that is gaining popularity is the longboard. 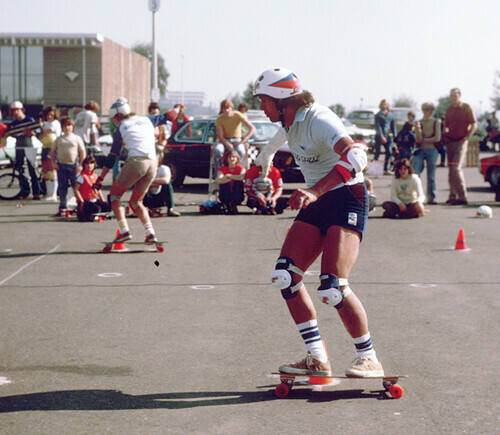 As the larger cousin to the skateboard, longboards began to appear in the 1970s in Hawaii as a variant to the shorter boards. Typically over 80cm long, the larger wheelbase decks are easier to learn on and faster to pick up. Unlike the Tony Hawk skateboards of the late 1990s, where being able to ‘ollie’ and ‘grind’ were the minimum street cred’ requirement, longboarding is far more accessible which is contributing to its growing popularity. Not only designed for travel, longboards can reach substantial speeds downhill, appealing to the thrill seeking, adrenalin junkies. And it’s not just blokes who are having all the fun. Women too are joining in on the craze, often using cruisers: a slightly shorter variant of the longboard. Designed for quick and easy convenience rather than serious speed, cruisers are the adult equivalent to the bright coloured Penny Board. Chris, a 24-year-old community social worker involved with youth and the homeless, recently fractured his wrist longboarding. However, he is still unwavered, “I’d always wanted to skate, but was never able to get into it during high-school”. However, since two of his best friends have become hooked, Chris has got on the board and hasn’t looked back. “I get so much joy from it – it is the only exercise I genuinely look forward to”. I hate seeing Americans in Europe. They are out of place. They don’t belong there, and yet they keep on popping up. But I’m not talking about actual American tourists / travellers. As I personally found them to be great fun, and far less obnoxious as their arguably un-fair cartoon cut-out stereotype that so called real travellers like to talk about. I’m talking about American actors, musicians and style-icons being shamelessly prostituted as advertising on European souvenirs. Appearing next to the Eiffel Tower; The Coliseum, even in the Gondola filled Venice. Elvis Presley, Marilyn Monroe, and Audrey Hepburn were the worst offenders, or offended – depending how you think about it. 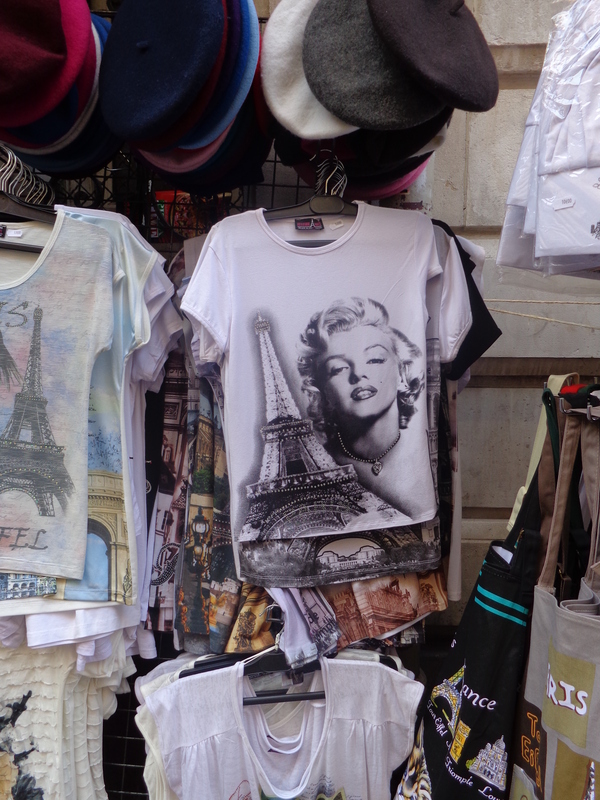 Take for example, this kitsch Marilyn Monroe and Eifle Tower t-shirt. Or an Audrey Hepburn souvenir that we saw in Paris shop window. What is she doing there?! Breakfast at Tiffany’s is an American produced film; set in New York, America; written by an American, Truman Capote, starring an American actress, Audrey Hepburn as a fictional American prostitute. Now, I am willing to conceded that Audrey Hepburn did star in the B&W film Roman Holiday with Gregory Peck where classic scenes of the couple cruising around on a Vespa in front of the Coliseum and other Roman icons; or Paris when it sizzles (1964). But that hardly means that she is suddenly Italian, or even French! 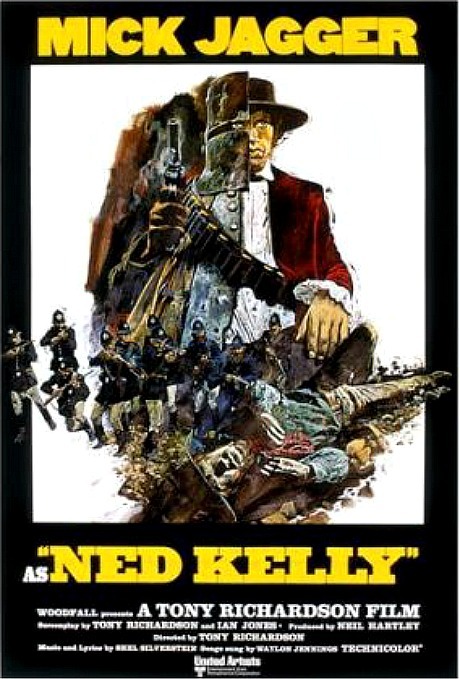 The equivalent would be to have pictures of Mick Jagger – who starred in a 1970 film about Ned Kelly, the iconic and notorious Australian bushranger and out-law – and have him and his big lips printed all over T-shirts, calendars, and mug-holders alongside Uluru, Sydney Opera House, or posing with penguins from Phillip Island, Victoria. 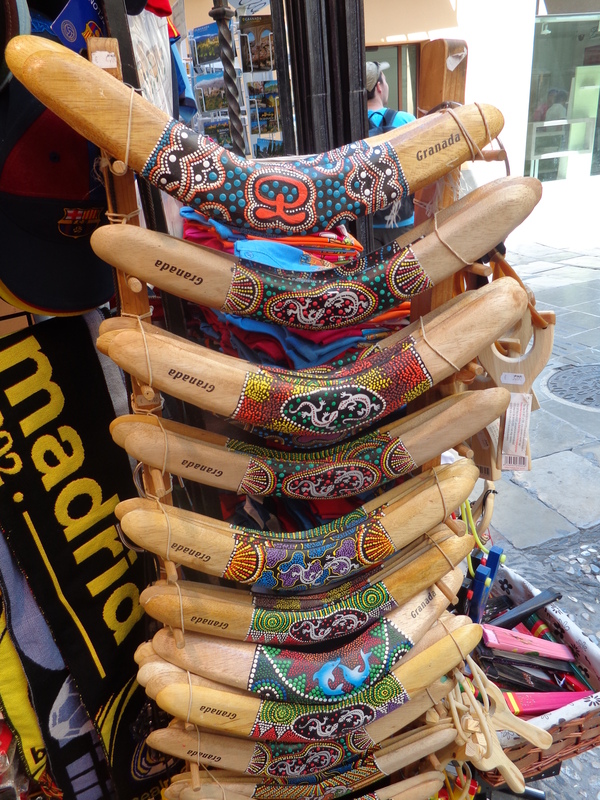 When looking through the souvenir shops and flea markets while travelling in Granada, Spain, I came across this original Granada boomerang. I didn’t know that the Australian First People had traveled all the way to Spain; or that they discovered how to use blue and green paints; or that the Spanish people had for some reason embraced traditional Australian Aboriginal tools and weapons. In the 1996 music documentary Hype, director Doug Pray shows that during the early 90s, when the grunge movement was taking off in Seattle, many record labels elsewhere were trying to leverage off this success. Albums, clothing, boots, instruments and amps were stamped with Seattle as a symbol of their street-cred – even if these items had little to nothing to do with this Washington city. And there are other countless examples of this sort of marketing. Where something that is originally unique is used, shamelessly and out of context, to try to give something else some pizzazz. And in doing so, dilutes the meaning of what was unique first item. It is a sad thing that marketing tries to leach off word-association value from genuinely unique ideas or images, and pass them onto garden variety products. I find it intensely frustrating how the word Jazz is slapped onto bars and restaurants to make it look cool – when in fact it has nothing to do with jazz at all. Jazz is reduced from being an alternative and potentially raucous art-form, to tame background music at a cocktail bar. It tries to borrow the edgy, mysterious, out-sider jazz ethic and pass that on; rather than generating some panache of its own. Perhaps this sort of ‘word theft’ is partially what Bob Dylan was so angry about in his 1981 song, singing “You want to water-down love” – disappointed at seeing the radical term ‘love’ of his new Christian faith, being diminished and reduced by televangelists nationwide.